We were in Banaras for a week to meet friends, family and have a good time generally. But the most encouraging part of this visit was the thought of malaiyyo that we were hoping to taste after so many years. About 15-16 years to be precise as we could not visit Banaras in winter season for these many years somehow. This visit in the last leg of winter looked promising for reasons than we had planned. Maliyyo was the topmost reason believe me. 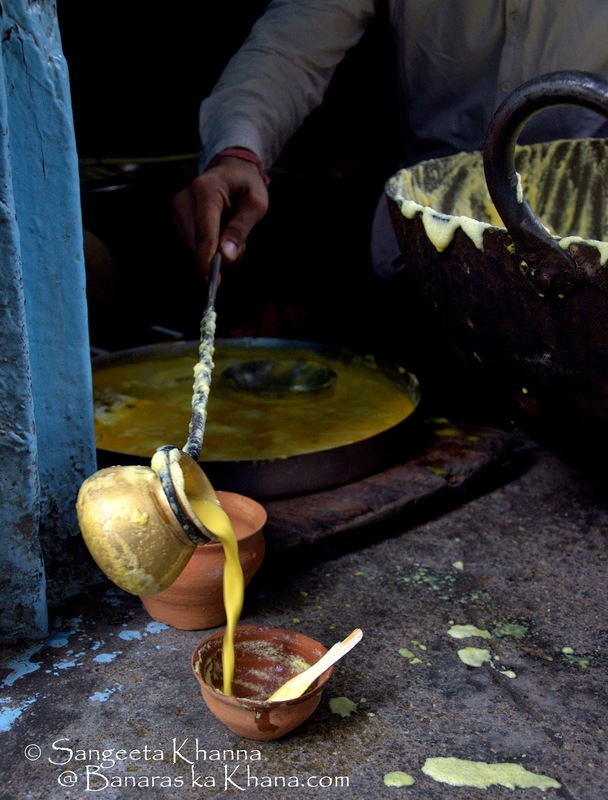 Malaiyyo is a 'saffron flavoured milk cloud' that is made by churning whole milk early in the morning during winter months by the shopkeepers in the old part of the city who are actually gwalas (keepers of cows) and produce and sell milk products including yogurt, khoya, butter and ghee depending on seasons. 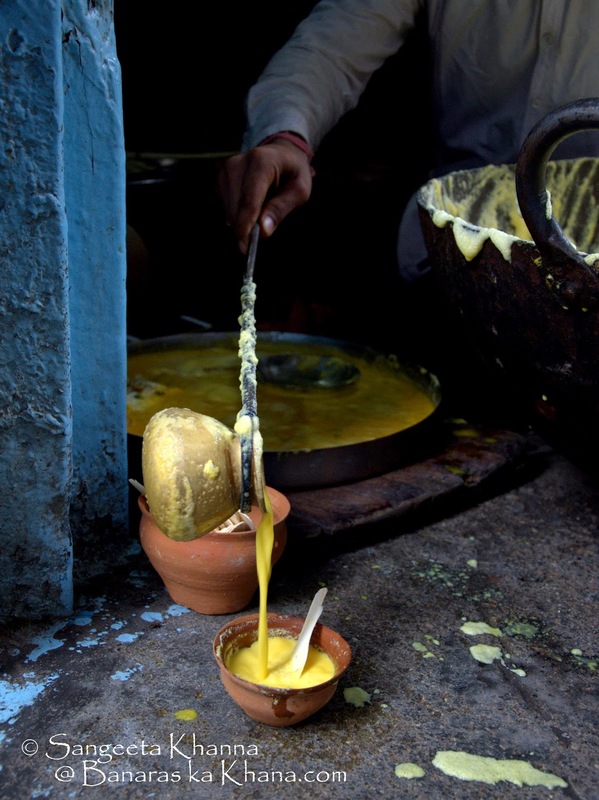 When saffron flavoured milk is churned slowly (manually) it results in the fats separating into a froth that is collected in a large kadhai (a utensil they use for many purposes through the year). 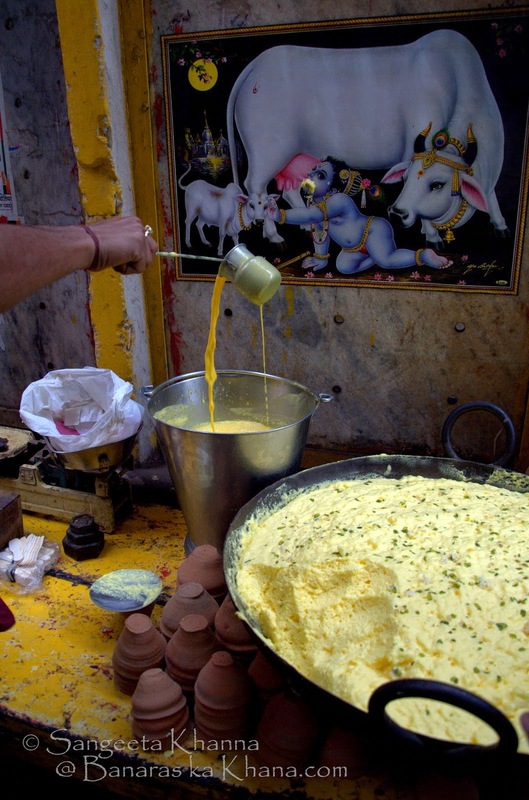 Later this frothy cream is sprinkled with finely sliced nuts and saffron to garnish. My research guide Dr. Goyle had introduced me to malaiyyo 2 decades ago as she used to live in Neelkanth area (in pakka mahal) and there were many malaiyyo vendors around her home. In those days small khomcha walas used to ply in the maze of those narrow lanes and would stop and ladle out a kulhad of malaiyyo for you on demand. You could get hold of them only in foggy winter months as the fog and low temperature would allow the malaiyyo to stay frothy the whole day but as the winter months would lead to spring you would find malaiyyo only in the small shops around Neelkanth and Chaukhamba lanes, the famous maze of gullies in Banaras that stay cooler than the city outside the gullies. These shops are literally holes in the wall with the edge of a huge Iron kadhai jutting out of it to indicate there is a malaiyyo shop. Not much crowded, only a couple of patrons getting the stuff packed for a nearby home or having it right there. This shop below is the one opposite to Gopal ji Mandir in Chaukhamba gully. 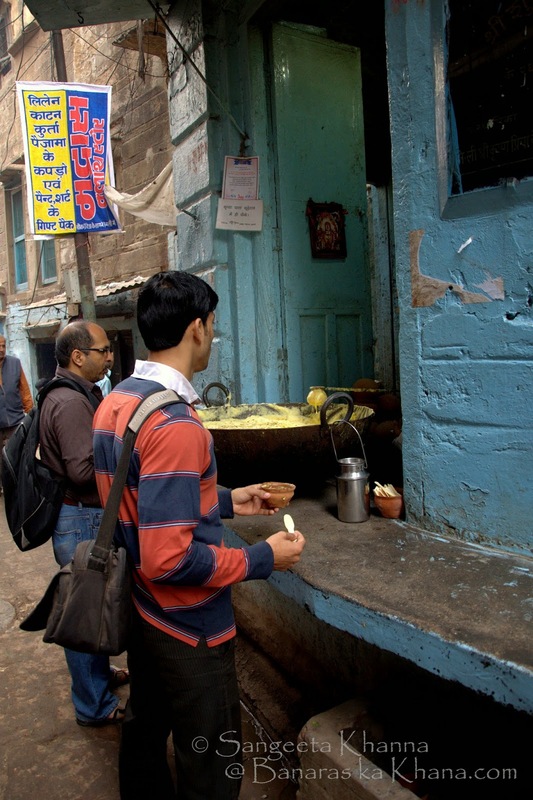 There is a world of difference between the city that breaths in the gullies of Banaras and the part of the city that chokes outside the gullies. Within a quarter of a century since I have been watching this city I see Banaras choking and suffocating on many levels. But pleasantly, I found the gullies almost untouched by the recent invaders. 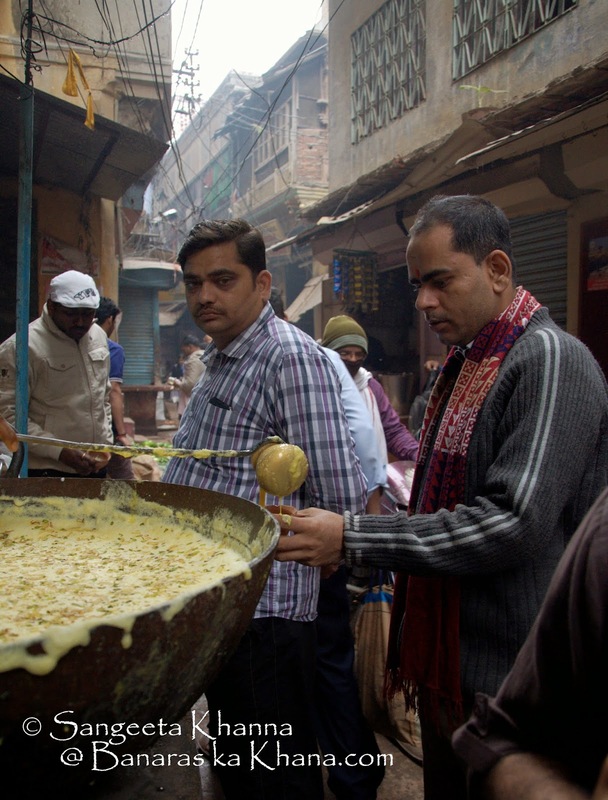 Apart from the gullies you don't see many banarasi people around, hoards of people have come and settled in the city from Eastern parts of the country and you don't get to hear that famous banarasi accent that often in the city. Not that I am complaining, but I feel Banaras is choking under the huge population it is supporting right now. Ranting over. Over to malaiyyo now, after all these years we were suspicious of whether we will get to taste it this time or not, as mid February temperature was already soaring to worry us. But we asked around and got to know that it will be available till Holi. One day early in the morning we started from home, it takes almost 40 minutes from Lanka to Chaukhamba and we reached there around 8.30 AM, changing auto and manual rickshaws twice. We do feel like tourists in the city now that we find ourselves unable to drive in the mad traffic, not even a two wheeler. But luckily the rickshaws are very efficient. Reach Godoliya from any part of the city, hire a rickshaw for Chaukhamba, tell the rickshaw owner to drop you at the gopalji mandir wali gully and he will drop you just there. Then start walking inside the gully you would find the first Malaiyyo wala in front of the Bhartendu Bhavan. You would want to ask for Gopal ji mandir several times to be sure of the directions as the gully meanders a bit, do not turn into any gully left or right. 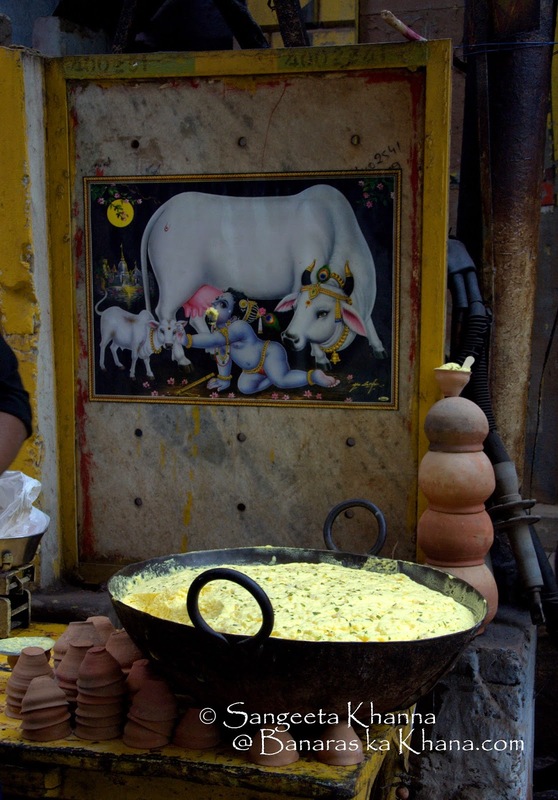 Ravi, the owner of this 'corner shop' has already offered the 'bhog' to Krishna as you can see in this picture and is serving the first kulhad of Malaiyyo to us. This stuff was good but not the best. 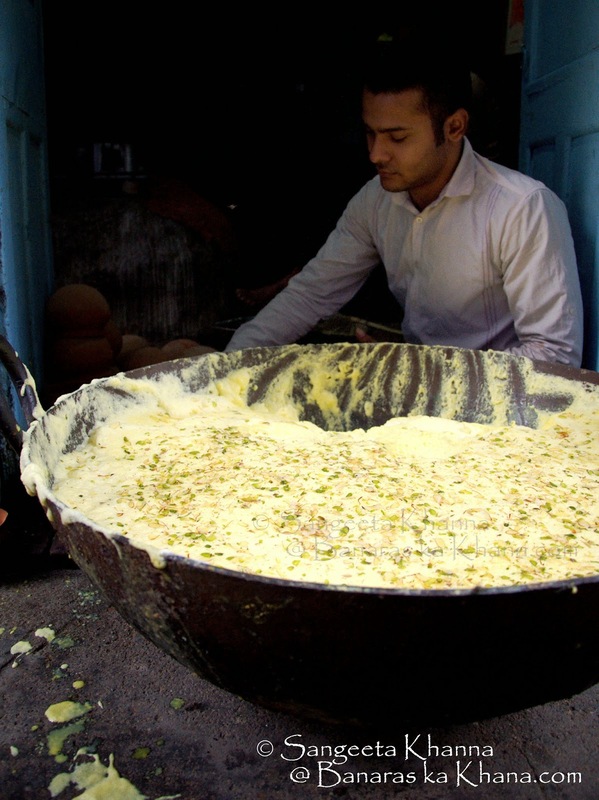 Still way better than the Daulat ki chaat we get in purani dilli. We asked for the malaiyyo wala doodh and he walked inside the gully on the right to bring a bucket full of malaiyyo wala doodh within a couple of minutes. This proves the malaiyyo is made using whole milk and not using transfat based icing/whipped cream. But to be honest, this malaiyyo had a little 'dalda' or trans fat added as I could feel the fat sticking to my upper palate. A trans fat containing malaiyyo will look a bit more fluffy and stiff the whole day while the real 100% milk fat malaiyyo would be like soft peaks falling and collapsing easily. This malaiyyo was good compared to the malaiyyo available in Bansphatak road where it is made fully of transfats and stays well the whole day even in summers. A trap for tourists waiting. I have never tasted this one though. Will share the pictures of the Bansphatak shop too. Ravi's shop in front of Bhartendu Bhavan is decent malaiyyo although you may find the gully quite unclean around the shop, which is just a wooden chowki (platform) where his wares are displayed. The malaiyyo is fairly stiff and frothy. The next Malaiyyo wala sits just about 10 steps ahead of this guy and had not started his business yet. You see the bhog offered to Krishna here too and the earthen kulhads waiting for customers. 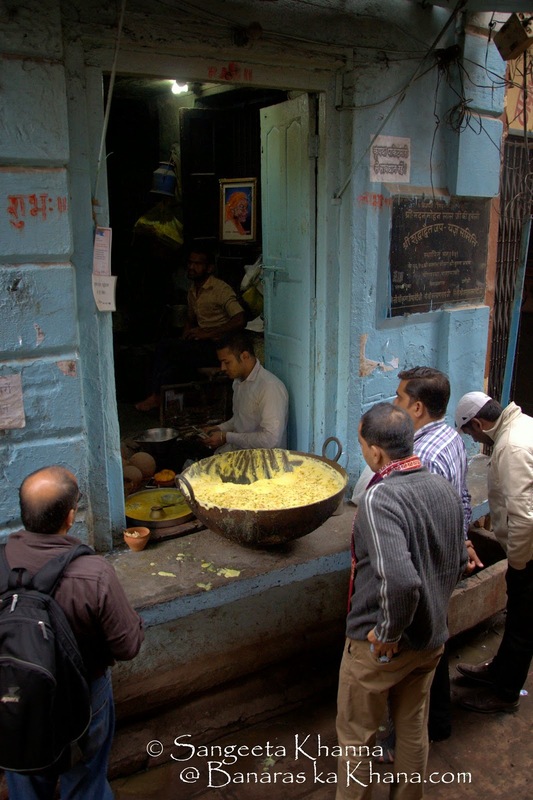 The city in the gullies doesn't start business too early in the day, people are busy doing the ganga snan and puja early morning and business starts after 7-8 AM for food stuff and from 10-11 AM for others. We were the first customers of Malaiyyo wherever we went to sample the taste. Walk a bit more to cross a small vegetable market on both sides of the gully and you reach the Gopalji Mandir on your left. 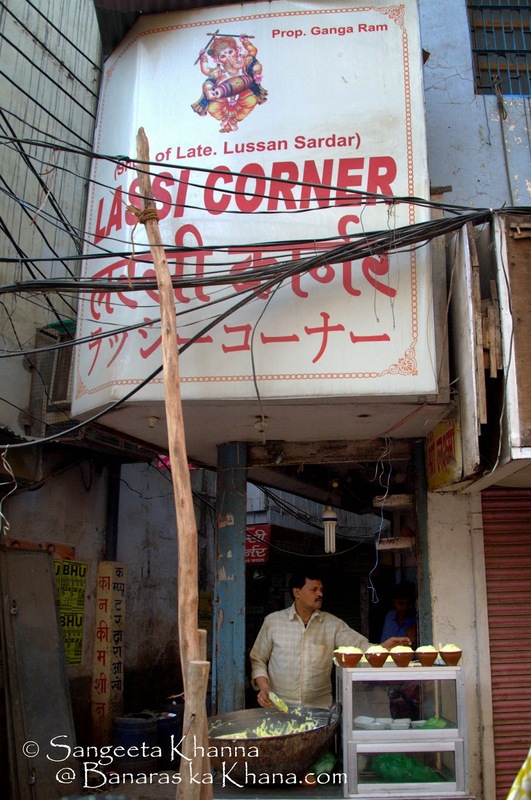 On the right side is this Malaiyyo shop by Markandey Sardar. 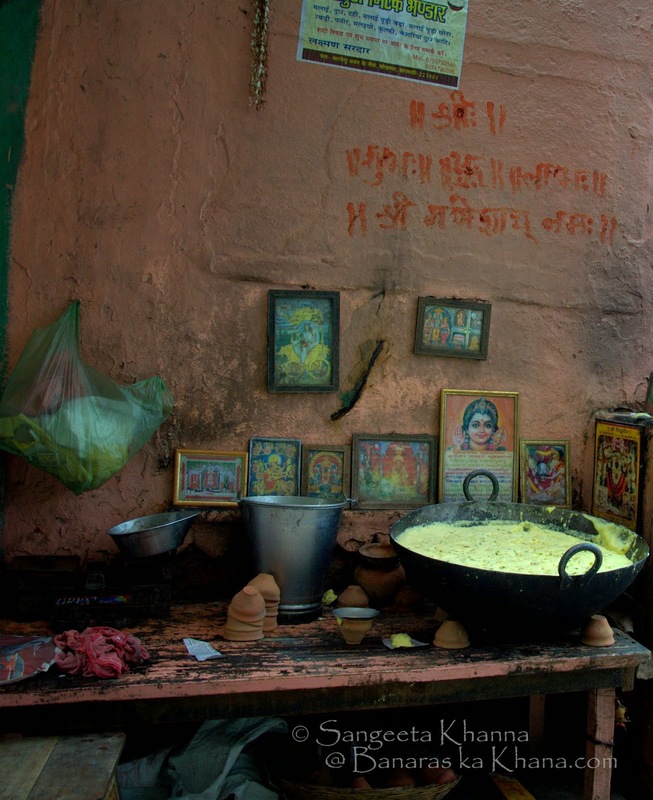 See the huge kadhai and the serving utensils propped up in this hole in the wall. This malaiyyo is not as stiff (means 100% pure milk fat) and the amount of nuts is generous. This particular shop was patronised by the royal families of Banaras in the past ans is still known for great quality and purity. And surprisingly the malaiyyo was a bit cheaper than the one at Bhartendu Bhavan. The interiors of the gully is not bitten by the touristy charm yet. 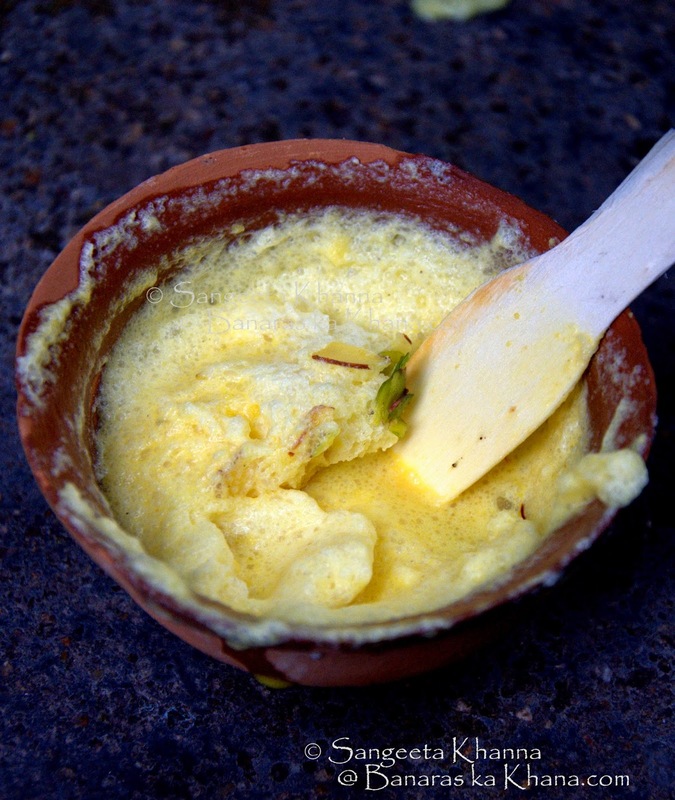 See the malaiyyo froth that is collapsing in this half eaten kulhad, indicating pure milk fat. This one doesn't stick to the upper palate when you eat. If you have a sensitive palate that is. The cost of malaiyyo wala doodh is included in the malaiyyo cost here. And he fills up your cup patiently. No hurry to finish. You can even have another kulhad without worrying about cholesterol and calories. Milk fat never causes cholesterol deposits FYI. And Malaiyyo is a far far better choice than ice creams and gelatos. You have to taste it to believe it. This confection might be a bit too sweet by your standards, was so for me but that doesn't mask the flavours of this wonderful thing on earth. See the content faces and the gully that leads to more infinite maze of gullies. I wish I could get this dessert more frequently although I have no trace of a sweet tooth in me. 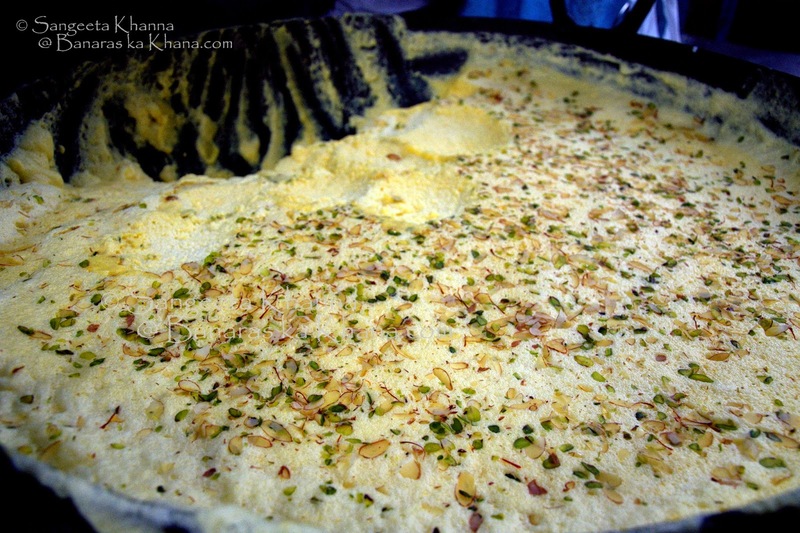 This is one of those desserts that result from the best possible combination of flavours and texture, and a dedication to create the best, the skill evolved through generations..
Malaiyyo is known as Makkhan malai in Lucknow and Nimish in Kanpur and Lakhimpur etc. Every region has their own minor variations in flavours but it is essentially a winter specialty and if you see it being served or sold in warmer seasons you be assured it is made of trans fats. 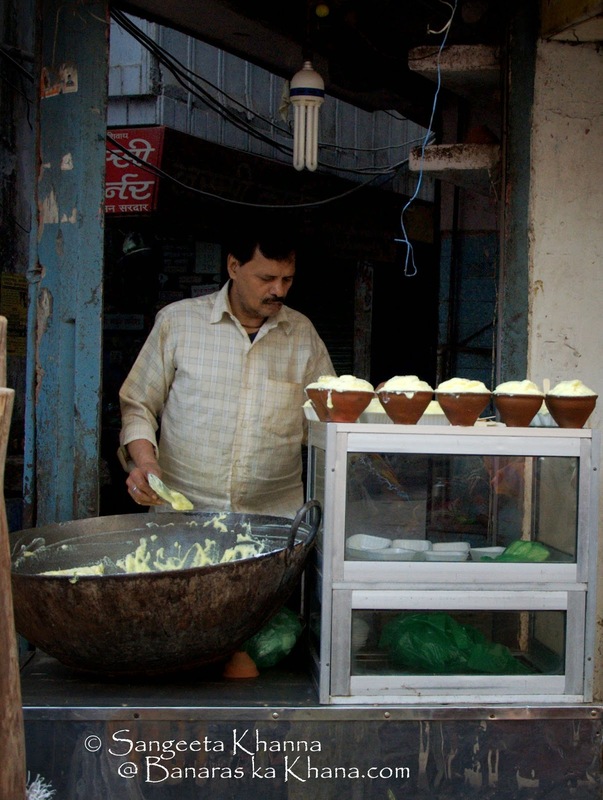 The Delhi version is called Daulat ki chaat which is white in colour and quite pale in comparison to the taste of Banarasi malaiyyo. This shop at Bansphatak sells malaiyyo all through the year, neatly scooped in kulhads for easy dispense to tourists. No locals eat malaiyyo here ever. Real malaiyyo once scooped out in kulhads will collapse really soon but here it stays for the whole day. Beware. This is fake malaiyyo. Real pure malaiyyo looks like this. Found definitely at Markandey Sardar, opposite Gopal ji mandir in Chaukhamba gully. 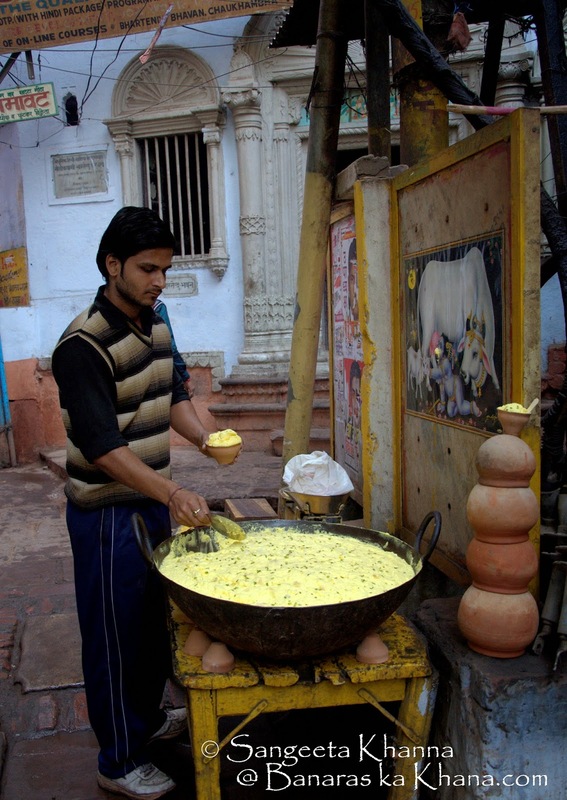 I hope you will definitely throng to Chaukhmba the next time you are in Banaras. Don't forget to carry an empty bottle to get some malaiyyo wala doodh for home. Malaiyyo can be carried within the gullies only unfortunately, it wouldn't survive even 15 minutes in the heat and dust of the city outside the gullies. Lovely read sangeeta! 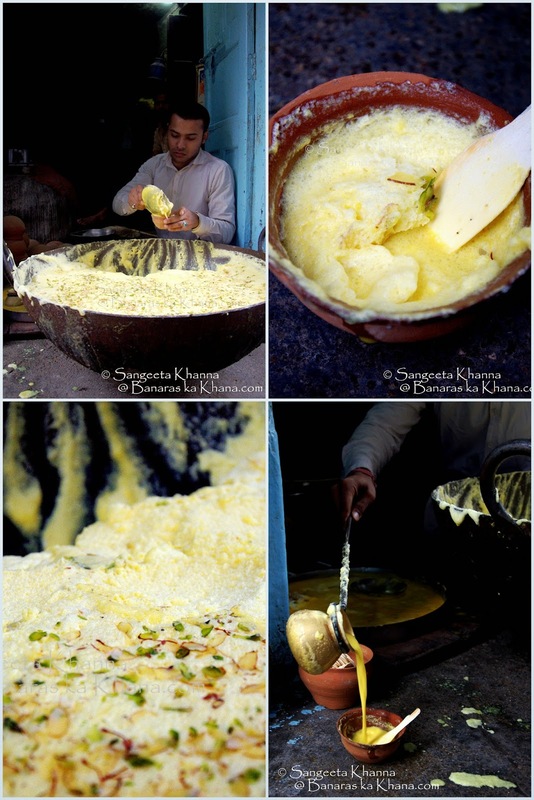 I felt myself walking around those gullies and that malaiyyo looks so tempting , and churned with all those garnishing on top, it surely is divinity served in a kulhads!!! Well written and an exhaustive post on the Malaiyyo. 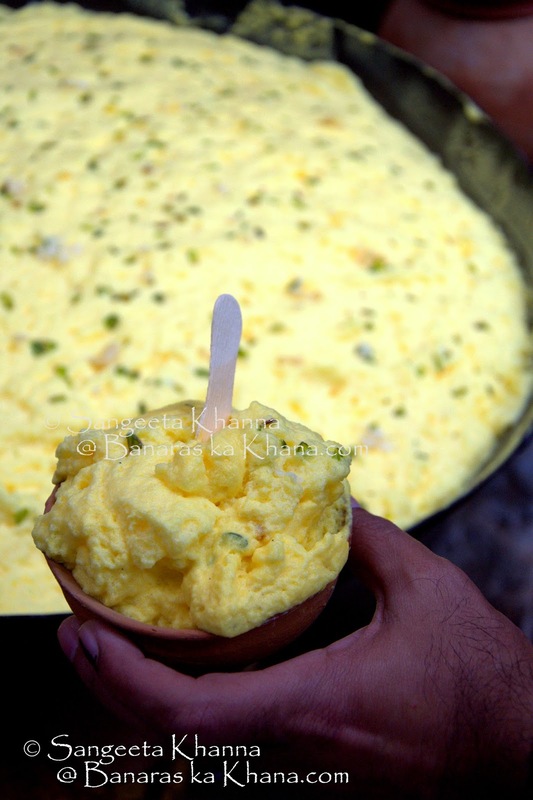 Will definitely make it a point to try this when I visit banaras in winter. Lovely post !! I wasnt aware of malaiyyo , but now i know. I will add it my check list in my Banaras Travel. The malaiya looks so tempting. Nice for taking us through this special journey. I remember eating Malaiyo on the main road from Chowk to Maidagin , a little ahead of Chowk Police Thana... available in the evenings. Malaiyyo in the evening means it is a trans fat malaiyyo. It cannot stand the heat of the day unless it is a very cold foggy day.